“THEATRE HISTORICAL SOCIETY OF AMERICA Annual Conclave (Convention) and Theatre Tours will take place in Southern California this year. June 21—27, 2005. 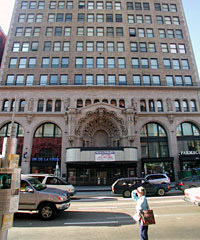 Headquarters Hotel is the famous Hollywood Roosevelt and for the San Diego Add-on the 1889 Horton Grand in the Gas Lamp District of Downtown San Diego. The following counties will be traveled into Los Angeles, Orange, Riverside, San Diego, Santa Barbara, San Bernardino, and Ventura. No one tours theatres like THS of A does they go from top to bottom! Fifty (50) theatres are planned if you take all 3 tours. The main tour cost is $395 for members. Cost of membership is $55. Hotels are on your own. This is a once in a lifetime opportunity as the saying goes. For full details go to www.historictheatres.org or or , Theodore R. Gooding Southern California Director and Conclave and Theatres Tours Chairman. FAX 626/356-0388"